Consumers often select ground beef that's bright red in color, assuming this is a sign of freshness but a dark gray-purple meat may not necessarily be a bad thing. No one wants to get sick from bad meat. Here are ways to choose the best meat and to protect yourself and your family from foodborne illnesses. All warm-blooded animals contain a pigment called myoglobin in their muscle tissues. This pigment is normally a dark grayish-purple, but when it comes in contact with oxygen, it becomes oxymyoglobin and turns a deep red color. To get that eye-pleasing coloration, most freshly ground beef is sold in clear packages of oxygen- permeable film. The oxygen goes through the film and allows the meat to turn that pretty red color we associate with fresh beef. This permeability is also why it is not recommended to freeze meat in store packaging. While you usually don't need to worry about the safety of newly purchased meat what's in your freezer is another story. Coloring can also indicate spoilage. If your package of ground beef is grayish all the way through and does not turn red when exposed to air for fifteen minutes or so, it is most likely spoiled. Usually, your nose will tell you right off the bat, as spoiled ground beef will smell sour. It will also feel tacky to the touch. Don't take any chances with spoiled meat. 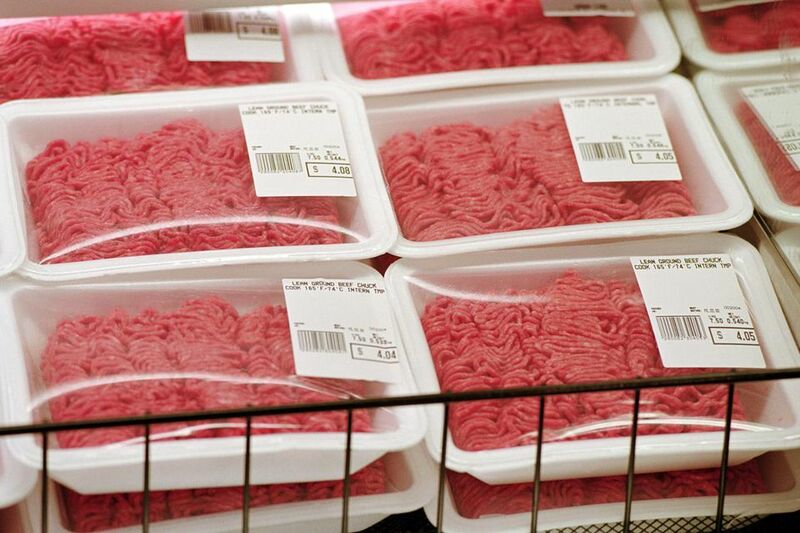 Beef products are susceptible to bacterial contamination by E. coli, salmonella and listeria. Proper handling and cooking procedures are essential to prevent foodborne illness. Other bacteria can contribute to accelerated spoilage. Ground beef is especially vulnerable since it begins with so many pieces of meat exposed to multiple handling procedures and equipment surfaces. Grinding exposes even more meat surface to bacteria. Fortunately, thorough cooking destroys bacteria. According to USDA guidelines, ground beef should be cooked to an internal temperature of 160 F. Use a meat thermometer to be sure. Bear in mind, this is a higher temperature than most rare or even medium-rare beef. The USDA now requires safe handling and cooking guideline information be affixed to all raw beef sold in the USA. Cleanliness when handling ground beef is of utmost importance. This includes not only your hands but your utensils and working surfaces. Do not use the same utensils or containers for meat and vegetables. Using the same knife to cut vegetables can contaminate your previously-safe beef and vice versa. Cross-contamination is the most common culprit responsible for food-borne illness. All utensils should be washed thoroughly with soap and hot water before using on any other food. Have You Been Encouraging Bacteria to Grow on Your Food?